Welcome to First Monday Podcast Reviews! Our goal is to provide reliable, credible reviews of technology and information science podcasts based on a set of criteria suitable for the unique characteristics of online audio media. Our evaluation criteria, described below, is based on the results of a research study by Joy Austria, Developing Evaluation Criteria for Podcasts (Libri. December 2007, vol 57. no. 4) and the set of criteria used by Edgy Reviews from That Podcast Show. Do you have a podcast you want First Monday to review? Questions or comments about our reviews? Email jaustria730 [at] gmail [dot] com. Purpose - The podcast has a clear purpose stated either in the program itself AND/OR on the podcast website. What is the podcasts purpose? Is it to educate? Is it to entertain? Does the content of the program relate to its stated purpose? Audience - The audience is clearly stated either in the program itself AND/OR on the podcast website. The host(s) keep their audience in mind with regards to story selection, content, word choice/language, music and overall presentation. Authority - Host(s) are qualified to present on the topic. Host(s) qualifications are either clearly stated in the program itself AND/OR on the podcast website. Accuracy - The podcasters make it easy for you to check on their references. References are either available as links on the website, transcript or are clearly mentioned in the program. Is there a transcript available? Introduction clearly outlines what will be covered in the episode. The host(s) move from one segment to the next with appropriate transitions. Written material (intros, outros and everything in between the audibles). Audio edits - Does the host edit their material in a logical manner? Is everything cut and pasted in a coherent manner? Delivery (applies only to host(s) - Correctly pronounces and clearly enunciates words. Host(s) demonstrate a range of vocal variety and vocal color. Pace or rate of speech is understandable. 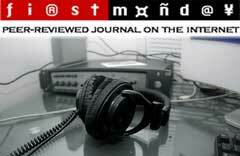 Audio Production - Recording does not interfere with audience comprehension of podcast. Use of sound effects, music and other audio devices serve a purpose and/or enhances audio enjoyment. They are not an unpleasant distraction interfering with audience comprehension. RSS Feed is available - Its easy to subscribe to the podcast (i.e. the feed is easily accepted into a feed reader like iTunes, Google Readers, or any other aggregator no error messages show up). Sound files are available on the website. They easily download. The podcast produces new content on a consistent and regular basis. There is an archive of past podcasts I can easily access and listen to past episodes. Podcasts are organized in a logical fashion (numerically ordered, by date, etc.). No dead links or 404:Not Found messages. First Mondays Podcast Chief Editors and Podcast Review Editors select podcasts by searching iTunes, Podcast Alley, and other sites for technology and information science podcasts. We also welcome suggestions from our audience! Review Editors are randomly assigned a podcast to review by the Chief Editors. Reviewers randomly sample a total of five episodes to evaluate. Review Editors use the above criteria as the a basis for their evaluation. Ultimately the question they must answer is, Why should our audience listen  or NOT listen  to this podcast?.